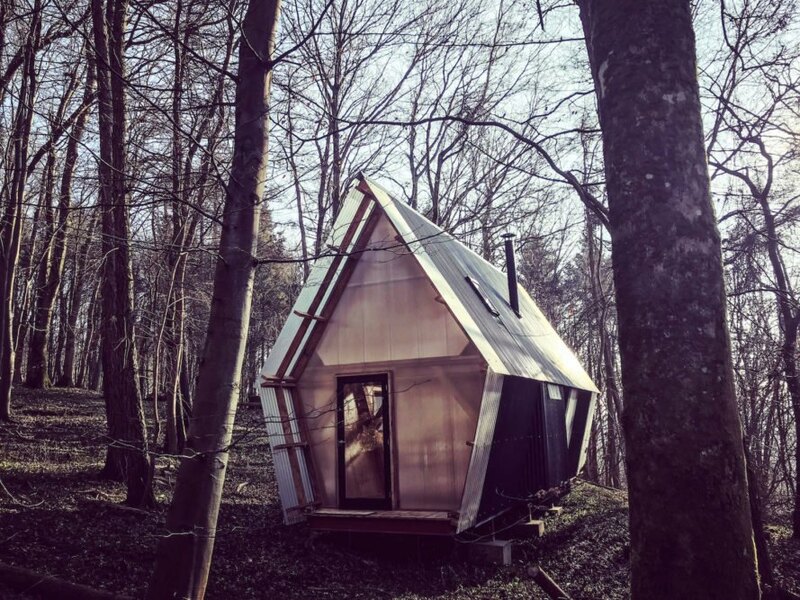 Transportable, versatile, and low-cost, this tiny timber cabin shows how the crafty use of local and recycled materials can lead to impressive results. 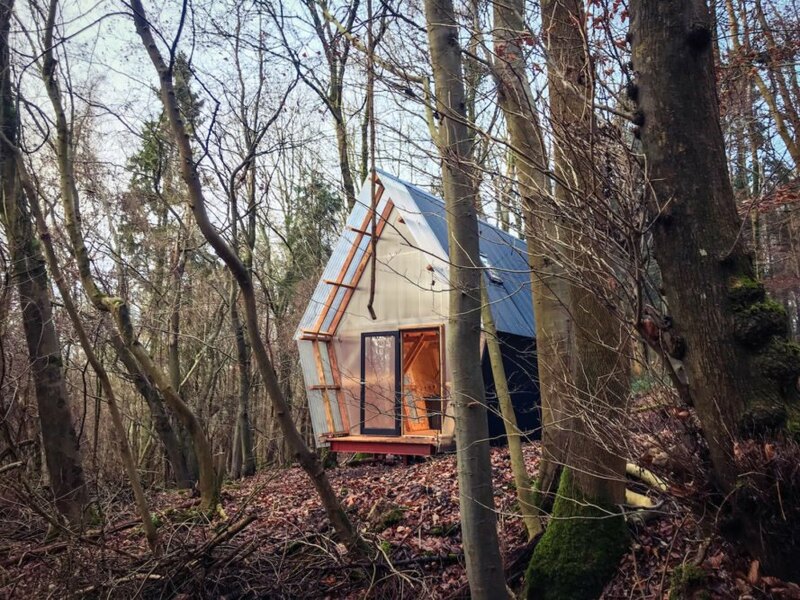 UK architecture firm Invisible Studio designed and built this mobile prototype for just £20,000 ($28,105 USD) using a combination of construction waste and locally grown unseasoned timber. Called Trailer, the multifunctional structure follows in the footsteps of Invisible Studio’s previous projects, such as the Ghost Barn and their own studio space, both of which were built from timber that was sustainably grown and managed on site. Corrugated fiberglass and steel clad the building, while high-performance interlocking polycarbonate panels cover the two gabled ends to allow an ample amount of natural light indoors. The interior is lined in used shuttering plywood and all the joinery, including the two staircases, is crafted from plywood offcuts. Leftover blue rope, sourced from a previous project, is used for the handrails. The doors and insulation were also reclaimed and the roof lights were purchased as factory seconds. To reduce milling costs, the architects used timber of the “same section,” meaning timber was cut into 125 millimeter-by-50-millimeter pieces and then laminated up into the structural sections for the cross frames. 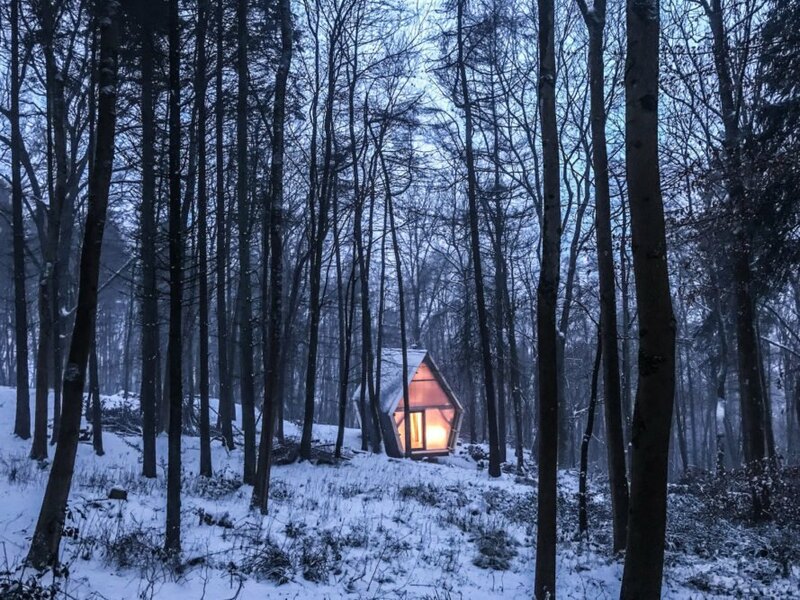 Transportable, versatile, and low-cost, this tiny timber cabin shows how crafty use of local and recycled materials can lead to impressive results. 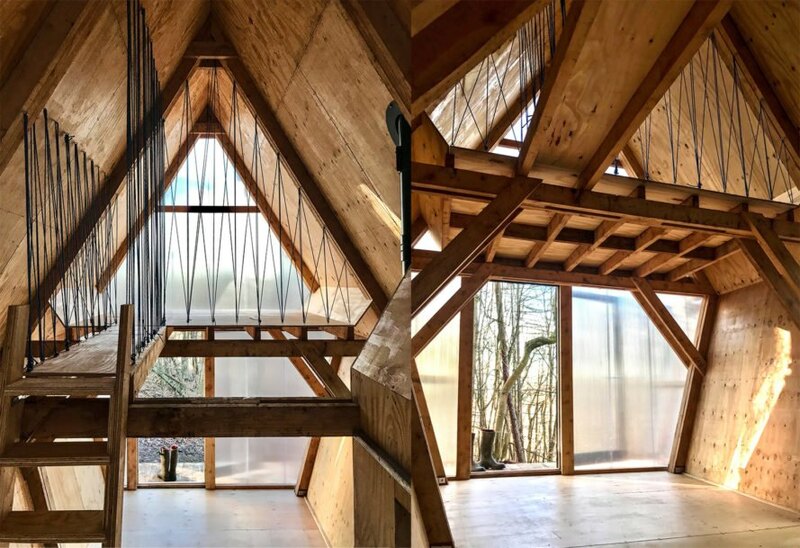 UK architecture firm Invisible Studio designed and built this mobile prototype using a combination of construction waste and locally grown unseasoned timber for just £20,000 ($28,105 USD). 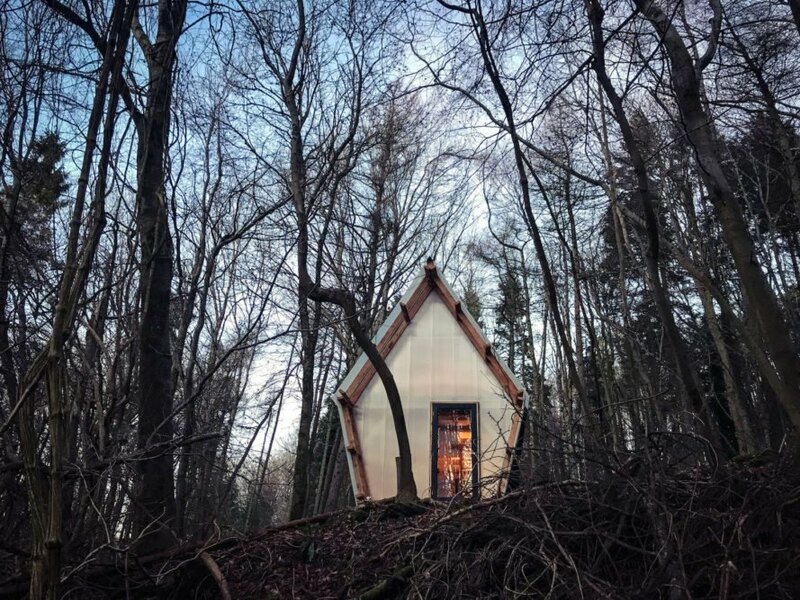 Called Trailer, the multifunctional structure follows in the footsteps of Invisible Studio’s previous projects, such as the Ghost Barn and their own studio space, both of which were built from timber sustainably grown and managed on site. 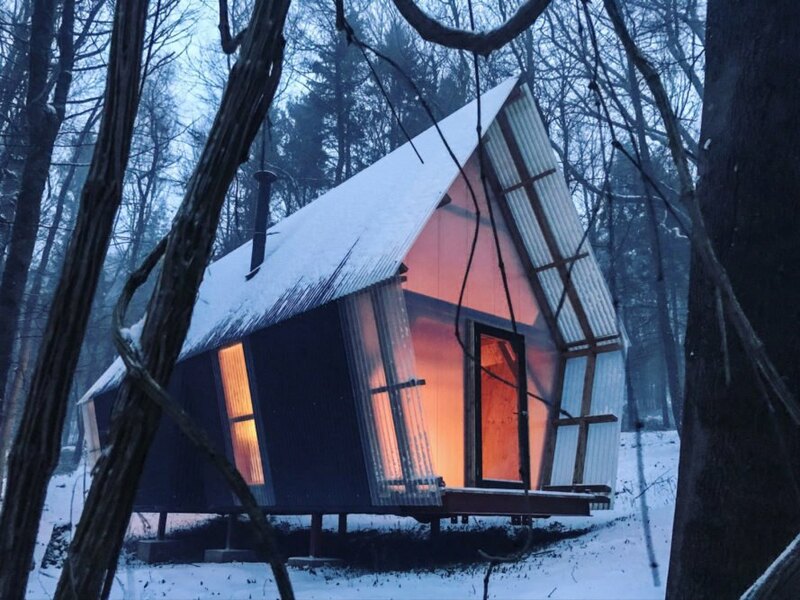 Located in the woods near Invisible Studio’s workspace, the 430-square-foot Trailer project gets its name from the trailer the built structure sits on. The architects designed the building so that it can be legally transported on a public highway and added a removable wheeled “bogey” beneath the steel chassis for ease of use. Corrugated fiberglass and steel clad the building, while high-performance interlocking polycarbonate panels cover the two gabled ends to allow an ample amount of natural light indoors. The interior is lined in used shuttering plywood and all the joinery, including the two staircases, is crafted from plywood offcuts. The doors and insulation were also reclaimed and the roof lights were purchased as factory seconds. To reduce milling costs, the architects used timber of the “same section,” meaning timber was cut into 125 millimeter-by-50-millimeter pieces and then laminated up into the structural sections for the cross frames.